What is it that makes Steptoe and Son funny? Well the scripts of course, and the ability of the two principle actors to take that script and make it come alive on screen. My favourite type of S & S episode is the two hander format without the meaningful participation of guest actors/characters, The Offer, The Lodger, Those Magnificent Men And Their Heating Machines, Death In The Family, Divided We Stand are all this style of story, Pot Black is of course another. 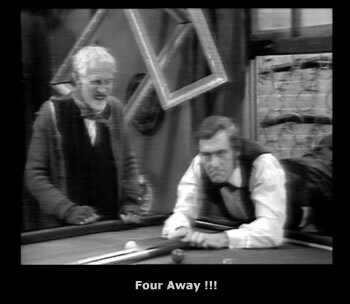 Pot Black is memorable for showing us just how pathetic and lonely Harold really is, the fact that he will do anything to score a victory over the old man, even to the extent of keeping him playing snooker in the rain against his wishes, shows just how downtrodden he really is. The fact that he has to resort to beating his dad just once at something to get some pleasure out of life is really sad indeed, it is also very, very funny. The look on Harold's face when he is putting his final points onto the score board that says he has won is priceless, he is so wrapped up in his victory that he doesn't catch on to what the old man has done. I would have loved Harold to have come back into the yard at the end to see what his Dad was up to, but perhaps that would have been cruel. Let him believe he got a moral victory over Dad, those little phantom triumphs are the only things that he has to look forward to, the only things that keep him going. A great episode and perhaps one of the best performances from Harry H. Corbett. Harold has bought a snooker table. Now to prove he's a better player than Dad.